Ah Korean Skin Care, I love it so much! I had always heard about the brand Belif that is sold at The Face Shop - it is a brand that uses time-trusted apothecary and Korean skincare science and utilizes superior and natural ingredients. They carry a wide range of skincare products from face masks, cleansers, moisturizers to body products. 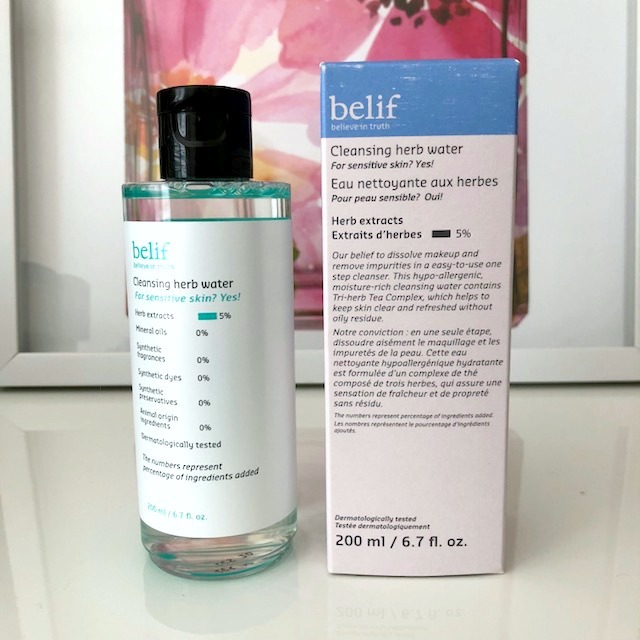 I recently had the opportunity to try out three different products from Belif, the 1) Cleansing herb water - $29 cad 2) Peat Miracle Clay Mask - $49 cad and 3) First Aid Anti-Hangover Mask - $39 cad. 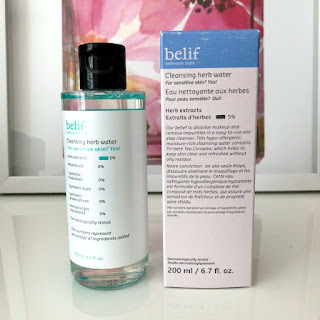 This is a cleansing water said to dissolve makeup and remove any impurities. It is hypo-allergenic, great for sensitive skin and helps to moisturize the skin (meaning you won't feel stripped and dry afterwards) and doesn't leave behind any product - it actually makes your face feel clean. I prefer using this in the morning to refresh the skin as I do not find that it removes all traces of make-up on my heavier make-up days. If you are just wearing powder, some blush and concealer it's fine but if you want waterproof mascara removed, this is a bit more difficult. This is a great product to use even after the gym for example and you want a quick refresher when just splashing water isn't enough. This has been great for me during pregnancy as I have not been using alot of make-up plus being quite tired consistently this cleanses my face with ease on a cotton pad. This clay mask is AMAZING! I highly recommend it. 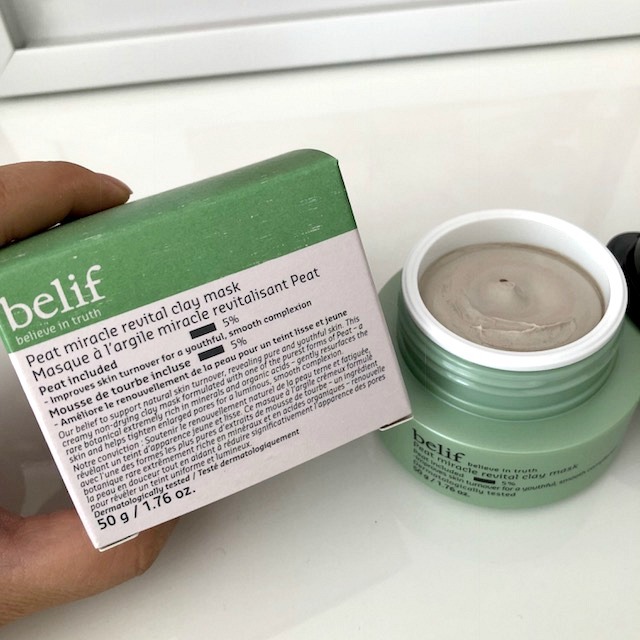 It is a creamy, non-drying clay mask that is said to contain the purest forms of Peat - a rare botanical, extremely rich in minerals and organic acids. I believe in this truly as when I applied this I saw it go to work immediately. It pulled out the oil and gunk from my pores and I felt it tighten my skin. When I washed this off, my skin was smoother than before and my skin seemed brighter. This is to be used 10 minutes each time and 1-2x a week. 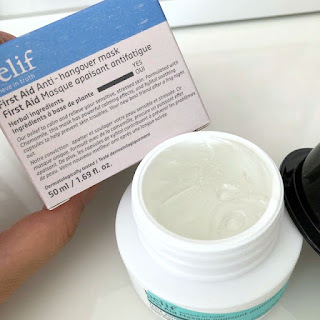 I have also applied this on problem spots such as a pimple and left it on for longer than 10 minutes and it helped reduce the swelling and inflammation. This is another mask which is the opposite of the clay one listed above. This is to help hydrate and calm your skin. It contains Chamomile and Xylitol to help with problematic dry or stressed skin. Apply a thin layer to the face, let set for 10 minutes then rinse off and continue with your regular skincare regiment. This is used 2-3x a week. This is great to use if you are feeling like your skin has lost its glow or is feeling dull and just blah - so I would say if you had a stressful, lack of sleep week and you just want an extra boost! 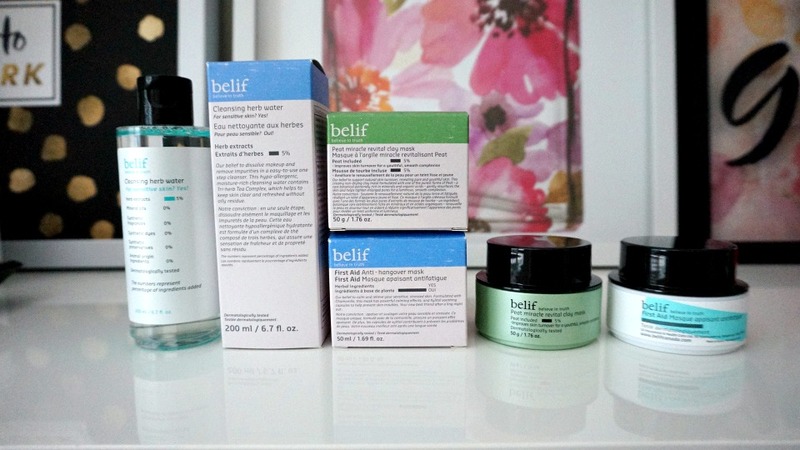 I thoroughly enjoyed trying out these products from Belif and want to try more!! The next items I want to try are: True Cream Aqua Bomb, Cleansing Gel Oil Enriched, Peat Miracle Eye Cream, Peat Miracle Serum, Mild and Effective Facial Scrub, Transforming Peel Off Mask, Milky Moisturizing Hydra Balancing, and Eucalyptus Herbal Extract Toner. I know it's a huge long list but it's an entire new skincare line that I would be trying and since the first three products I've tried worked for me, I'd like to see how the rest is. FYI - Out of all three products, I highly suggest the clay mask! I love Belif! The aqua bomb is amazing, definitely must try!